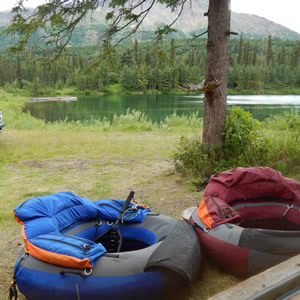 Sometimes it’s hard to describe a fly fishing trip that was absolutely “over the top,” but this year’s spring tubing at Adventure Denali, in the shadow of Mt McKinley, was just that! Beautiful weather and lots of BIG fish were the order of the day. 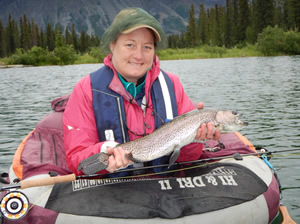 The immense rainbow trout that this trip is known for were especially accommodating in taking our flies. Some of the large and small streamers that we always used worked well attracting the fish, but it was nymphs that took the prize—especially the Czech nymphs that I brought for us to try. I don’t know whether it was just the novelty of these flies that made them interesting to the fish, or that they were just getting tired of seeing leech patterns, but it didn’t matter. They practically inhaled them. 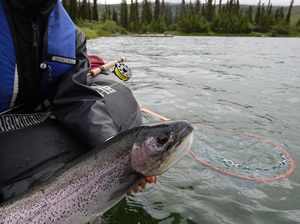 Maija was the first to connect with the small flies, and managed to play and land her very first fish on a fly with them. She was ecstatic as she held the mid-twenties fish right next to the tube for a picture. 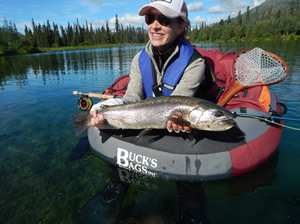 Not only was this was her first fly-caught fish, it was also her first fish in a float tube to boot! “I knew I was going to like float tubing,” she grinned. Laura wasn’t far behind. She gasped as her rod tip suddenly bent straight down with the weight of a good fish. “Paddle, paddle” I kept reminding her so that she could keep the fish tight while she fought it. It wasn’t long until we began to ease the fish toward the surface, and we could see that it, too, was going to be a beauty, well over twenty inches. Right after we had released the first fish Laura flipped her fly out to the water, and almost before she started to troll again, a second fish grabbed it and took off with it. Both of us were flabbergasted! She could hardly get herself together to remember that she needed to let the fish run or he would break her off. She planed him well, and we could see that was ready to be netted, when it suddenly took off, wrapping the leader around her flipper and snapping it. Darn! Our day on lake #3 was absolutely fantastic. Known for its incredible of numbers of Arctic grayling, it also holds some large rainbows. The grayling took our dry flies and/or nymphs one right after the other time after time, after time, and we sometimes lost track of how many had been landed. We also did some fishing from the bank of lake #2 one afternoon and managed to catch a bunch of smaller rainbows and grayling. 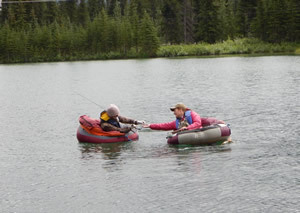 This lake is being seeded with fish, as it too, is prepared for use by anglers. Our trip ended as it always does back at the first lake, where the big bows were clearly visible as they followed us up and down the lake. We’ve decided that they are in love with our flippers, since we have no other explanation for this behavior. By this time, the gals had the techniques down pat and fish after fish came to the net. We still have a couple of spots available for our August 25-28, 2016 trip to this great lake system, so let us know if you want to go along. You won’t be disappointed! !